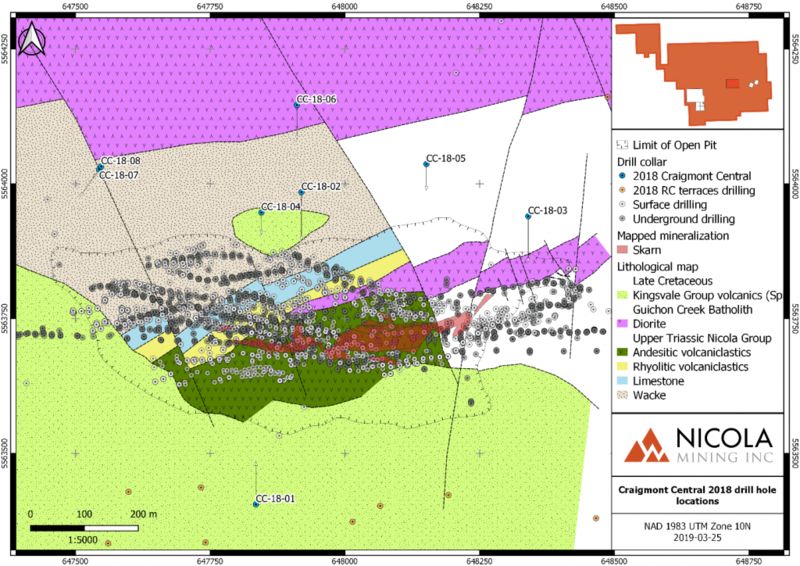 Nicola Mining Announces 2018 Diamond Drilling Prgram At New Craigmont Central With Grades Of Up To 1.35% Cueq Over 76.6 Metres | Nicola Mining Inc.
April 08, 2019, Vancouver, BC – Nicola Mining Inc. (the “Company” or “Nicola”) is pleased to announce additional drill results from its 2018 Exploration Program at its wholly-owned New Craigmont Project (the “Project”), located 14 km from Merritt, British Columbia. Drill results are from the Craigmont Central (“CC”) Zone (Table 1) and were designed to explore the boundaries of the historic open pit. The economic contribution from magnetite is taken into consideration in this release and reported as a copper equivalent (“CuEq”). Historically, the average recovered grade of the ore was 1.28% copper. The historic drilling primarily focused on specific lithological units, which have an East-West trend (Figure 1). This led to very little exploration drilling to the north and south of this corridor of high-grade mineralization. Through the review of the historic drill hole database and available historic drill core, it was identified that known copper mineralization was not sampled as it was possibly considered marginal to the high-grade bodies. These low to moderate-grade mineralized zones, peripheral to the mine workings, are key targets within the Craigmont Central area. A total of 8 diamond drill holes totaling 2755 meters were drilled to test low to moderate grades peripheral to the mine open pit in 2018 (Figure 1). Table 1 displays the 8 holes along with their respective copper and copper equivalent grades. Mineralization was encountered as shallow as 50m depth, with higher-grade intercepts appearing to be extensions of the Craigmont Skarn. A significant observation is that mineralization was identified within the hornfelsed wacke units, formerly not considered to have potential for economic mineralization. This idea creates potential for exploration beyond the limestone and “limey” sediments, along strike and proximal to the historic Craigmont deposit. Drilling in 2019 will continue to focus on the potential of Craigmont Central. *The interval (zone) for the intercept originally reported in Nicola’s Sept. 25, 2018 News Release, was redefined as part of an internal data review. Nicola Mining applies a thorough quality assurance/quality control program at the Project, which is compliant with industry best practices. A qualified geoscientist has logged and sampled all core samples, which are delimited according to lithology, alteration and mineralization characteristics. Where significant mineralization is identified, the diamond drill core is halved. Half of the drill core is placed in a labelled sample bag with along with its sample tag. The remaining, duplicate half core is retained at the Craigmont property as a physical record. Suitable blanks, duplicates and certified reference materials are inserted into sample batches, which are submitted to the Activation Laboratory (ISO 17025 Certified) in Kamloops, British Columbia, and analyzed using the ICP Aqua Regia 38-element (IE3) package. All results included in this release have passed the QA/QC procedures as described above and have been reviewed by Kevin Wells, P.Geo. There are no known factors that could materially affect the reliability of data collected and verified. In November of 2015, Nicola became the first group in decades to consolidate ownership of the New Craigmont Project (the “Property”) and has been actively conducting mineral exploration since. The Property is a wholly-owned copper property with an active mine permit (M-68), located 33 km south of the world-class Highland Valley porphyry district. It lies at the southern contact between the Nicola Group rocks and Guichon Creek batholith, of which the latter is known to be a precursor to mineralization at Highland Valley. There are currently no mineral resource estimates on the Property. Historical “non-NI 43-101” resource calculations are recorded in internal memos and geological reports for Placer Development Ltd. An internal memo estimated 60,000,000 pounds (27,000 metric tonnes) of >1.5% copper ore remained unmined from an original ore estimate of 27,754,000 short tons (25,178,005 metric tonnes) of copper grading 1.79%, following mine closure. A mineralized zone (Body No. 3) is known to contain an estimated 1,290,000 tons (1,170,268 metric tonnes) of copper ore grading 1.53% copper, with a 0.7% copper cut-off grade and a 20-foot mining width between drill sections 6565E and 8015E. During mine closure a comprehensive report highlighted a 60.0 million tonne halo grading greater than 0.4% surrounding the western extension of the high-grade underground ore body. It should be noted that these historical estimates do not meet the requirements needed to conform to National Instrument 43-101 standards. The Company notes that an independent Qualified Person has not done sufficient work to verify and classify the historical estimates as current mineral resources and is therefore not treating the historical estimates as current mineral resources or mineral reserves. For further details on the Property, see the technical report entitled “Technical Report on the Thule Copper– Iron Property, Southern British Columbia, Canada”, filed on May 8, 2013 on Sedar at www.sedar.com. The 2018 Exploration Program was explained in the Company’s May 1, 2018 news release. Bristow, J.F. (Jul. 22, 1985) Internal memo: Continued Exploration at Craigmont Mines Limited’s Merritt Property.